Dylix Corporation is your source for all your pressure measurement needs. As a leading pressure instrument manufacturer, Dylix designs and manufactures pressure transducers and transmitters for many different types of markets such as Oil & Gas, Waste/Water, Food, Dairy & Pharmaceutical, Automotive and General Machine Control. We are also one of the pressure measurement industries’ most reliable pressure sensor manufacturers. If your application is industry standard or requires a special engineered solution we have the production capability, engineering support and the desire to exceed your expectations. Contact us today. The Dylix GXS submersible pressure transmitter is designed to perform clog-free in continuous submersion for waste water and sludge applications. 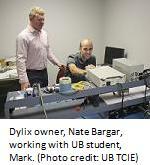 Dylix has completed phase one of our strategic partnership for industrial resurgence (SPIR grant) with the University of Buffalo. We had a Doctoral Candidate work with us for several months analyzing present and future electronic capabilities.